Ballymascanlon House Hotel is a home away from home in Co. Louth so if you are looking for somewhere different to celebrate Christmas this hotel is the place to be. The Ballymascanlon does exactly what it says on the tin; it provides luxury, warm hospitality and comforts all under one roof. It oozes tradition and history and lacks nothing. My husband John and I recently had the pleasure of visiting the hotel for a friend’s wedding. We checked in for the night. We had several options for accommodation in Dundalk, Co. Louth but after hearing rave reviews about this spectacular Victorian House we made our booking. Leaves had just begun to fall from the trees making for a very pretty drive up to the 150 year old house. We were extremely impressed with the sight before us as we rounded the corner to the hotel. Before getting out of the car I already knew I was going to like this place, I’m a sucker for old houses, castles and anything vintage and this hotel certainly didn’t disappoint. The hotel creates magic or at least a magical feeling. I felt that we were transported to a different world during our stay, making my husband and I relaxed and exuberantly happy. The hotel surpassed our expectations. The food was top class, the hospitality shown to us during the wedding and the stay was second to none. The rooms were spacious, traditional and welcoming. The kind of traveler that frequents the Ballymascanlon hotel is the one seeking a time out from life. It’s very easy to forget ones troubles when spending time at this hotel. John and I usually travel with our kids, Colum (22-months) and Sadie (7-months) and although it was a wedding for just the two of us we decided (because we couldn’t get a babysitter) to bring them along for the adventure. We availed of the hotel’s babysitter, Katarina – a wonderful staff member who paid great attention to the kids, so much so that my son is still talking about her. While I attended the church part of the wedding John utilized the time to “wear out the kids.” He spent over an hour walking the grounds of the hotel. The day was dry, the air was fresh and all was well with the world. He is ready to go back again and we will as it’s less than an hour from Dublin and an hour from Belfast making it bang central for those traveling Ireland and wanting some peace in between. The selection of menus in the restaurant offers informal and wonderful bistro fare. Using only the freshest of ingredients the chefs prepare a variety of dishes to satisfy everyone’s palate. Although we don’t golf the 18-hole course allowed golfing guests to enjoy their play over exhilarating landscapes. John told me after his walk that he was surprised how many golfers went by him on their way to the course on this cold winters day. It must be THAT good. When he returned he saw many hotel guests, book under arm, retreating to one of the fine reception rooms of the hotel. A stay at the Ballymascanlon House hotel is a truly restorative experience so it isn’t a mystery why it’s a firm favorite with wedding couples, golf enthusiasts, spa-goers and families. There will be plenty of golfing, games, story-telling, music, movies, food and even a visit from Santa Claus for the kids too. Don’t miss out. 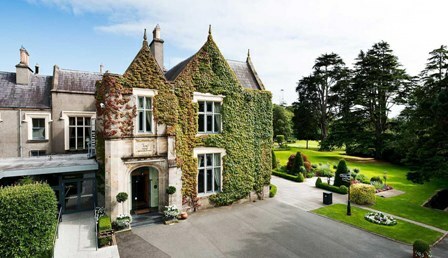 For more information visit Ballymascanlon.com.